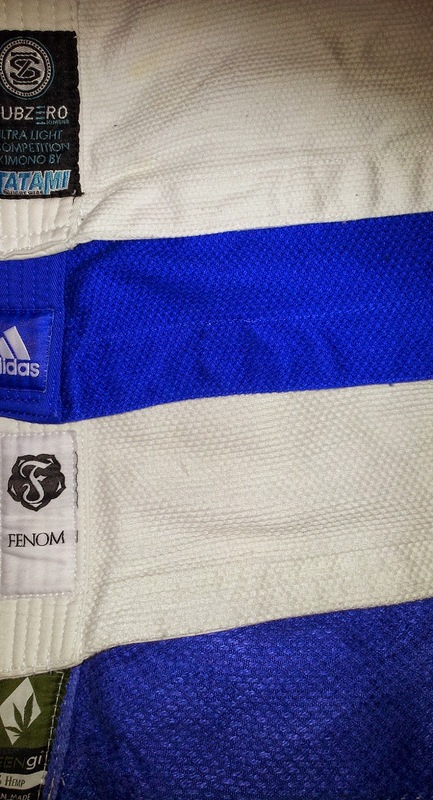 Short Review: Global sports brand adidas has revamped its BJJ line. The Contest is the second of the four models, available in blue, white and black. It features the famous adidas stripes all down the arm and halfway down the leg: stylish, but also abrasive if you are in the habit of wiping sweat off with your sleeve. The drawstring is among the sturdiest I've seen, though it's too long for my liking. I also found that the inner jacket stitching was so rough at first that it rubbed my chest raw, but in fairness this was before I had washed it. That wasn't an issue after multiple washes. The fit of the A1 on my 5'7 and 66kg frame is pretty good, though slightly baggy in the chest. Quality is evident throughout: this is a well-made piece of sports equipment, as you'd expect from something with the adidas pedigree. Available to buy here for £100 (in the US, there is a 40% Black Friday discount here - the code is SALE40 - until 12:00am on the 2nd December, EST), or a few quid less for the white version. Full Review: I am guessing that most people have heard of adidas (which I only realised wasn't capitalised in the process of doing this review). In 1924, Adolf 'Adi' Dassler (born 1900) founded the 'Gebrüder Dassler Schuhfabrik' (Dassler Brothers Shoe Factory). By 1949, he had fallen out with his older brother Rudolf (who as everyone knows went on to create rival sports brand, Puma), setting up on his own as the 'Adi Dassler adidas Sportschuhfabrik.' Rudolf was almost as lacking in imagination when it came to names, originally calling his operation 'Ruda'. That dispute had considerable repercussions. Not only did it split the family, it split the whole town in which both companies were based. It also, according to this old piece from the Chicago Tribune, led to major changes within the Olympics, particularly in its increasing commercialism. As journalist Phil Hersh put it, "Puma [...] pioneered under-the-table payments to athletes in an attempt to win loyalty. By the 1968 Olympics, Adidas fought back by handing out $100,000 to athletes who would wear gear with the company`s three-stripe trademark." The feud was finally laid to rest in 2009, when the two companies had, appropriately enough, a football match. Teams were mixed: the boss of adidas was the striker for the winning team, while Puma's head was cheering him on from goal. In 1967, adidas diversified from shoes into apparel, creating a tracksuit for legendary German footballer Franz Beckenbauer. Over the '70s, adidas became a truly multi-sport business, something that continues today. Run DMC's favourite brand has been in the BJJ market for over a decade, dating back to at least 2002 (at that time in conjunction with Seka-Sports). The marketing proudly announced that adidas was working with Jean Jacques Machado, but the response to the Machado Signature gi was not overly positive. 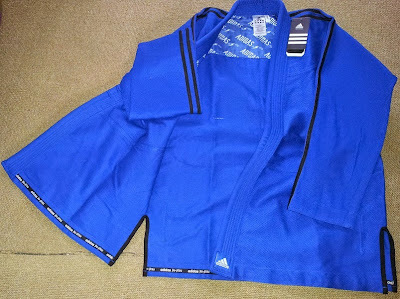 Looking through the impressively extensive archives of JokerJitsu (who must surely be the grandfather of all BJJ gi review sites), there's an entry for the adidas Machado Signature gi. The customers posting around 2008 do not sound all that happy. 'Contest' is a name adidas regularly use, appearing alongside the Machado Signature back in 2002. Oddly the picture accompanying that gi is of a guy launching a high kick at his opponent, indicating adidas had a limited idea of what BJJ actually involved at the time. 'Contest' was part of their karate product line of the same year, as well as for judo. The face of adidas is no longer the venerable Jean Jacques. That three-striped crown has passed instead to Clark Gracie, having earlier been held by Romulo Barral. Clark is an excellent choice for adidas gi model, given his meme-approved good looks. As a huge sports brand, selling everything from football shoes to tennis rackets and toiletries, adidas struck me as being in a very different position to the BJJ brands I'm familiar with. Companies like Tatami Fightwear, Fenom Kimonos and Flow Kimonos are all run by people who train. You'll see them supporting open mats, helping out with BJJ charity events and sponsoring tournaments. You might even compete against the company founder. I've been able to watch these companies grow: in the case of Tatami, that's gone from a small Welsh outfit to major global player in the BJJ world. An enormous corporation like adidas is totally different: they have been a business powerhouse since my grandparents' generation. However, that does not necessarily mean adidas is disconnected from Brazilian jiu jitsu, as I might have first assumed. Along with their twelve years of producing BJJ products (if I'm assuming that started with the Machado Signature in 2002), adidas also made sure to get somebody from jiu jitsu to head up their BJJ division. 51 year old Raul Montolfo has an extensive competition record and a black belt under Carlos Gracie Jr, teaching at Gracie Morumbi in Camarillo, CA. In his interview with Jiu Jitsu Magazine, Montolfo states that "We have a team concentrated totally on our community." He reiterates this later, in response to another question: "our concept at adidas is to be truly a part of the community." Judging by this 2011 interview, Montolfo has been involved with the adidas BJJ line for at least three years. In JJM, he also points to Adidas Combat Sports, the arm of adidas set up to deal specifically with jiu jitsu, judo, boxing and various other martial arts (or combat sports, if you prefer). Looking around, there is an article from last year about a social project in Brazil, of which jiu jitsu is a small part. 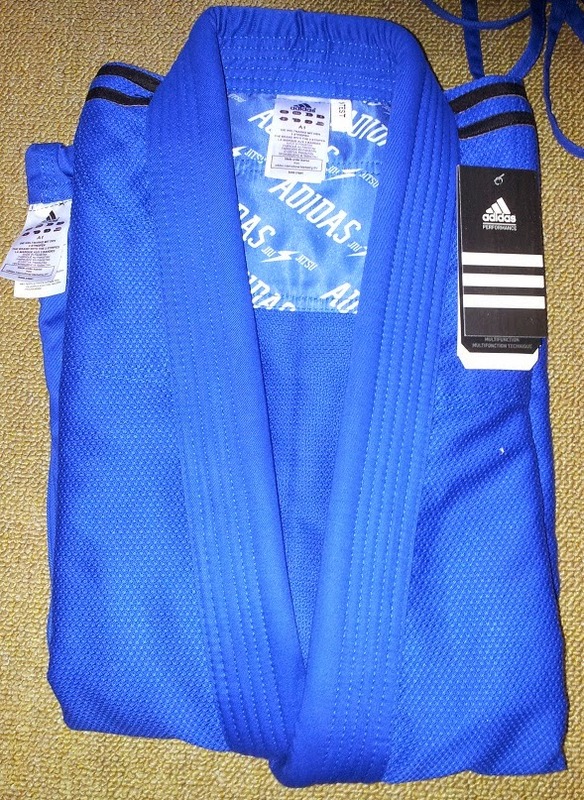 I'm not sure if adidas has other charitable initiatives related to BJJ planned, but they are becoming increasingly visible on the sponsorship side of things. Their advertising sidings can be seen at various events, something that's potentially exciting for the growth of the sport. If major players like adidas can make a success of its involvement with jiu jitsu, that might bring in other big mainstream brands. The adidas Contest comes in the standard colours of white, blue or black, 100% cotton. The jacket is 450gsm, comparable to most of the other jackets I've worn. It is described as a "hyperfly single weave" with the "durability of a double weave." That probably translates to another term, gold weave, something that evolved into pearl weave and myriad other variations in the last few years. The pearl weave on the Tatami SubZero appears to be comparable, but you can judge for yourself looking at the comparative picture (click to enlarge). Somewhat bizarrely, the weave for the white Contest is described on the Cimac website as an 'Atama single weave'. Either way, the manufacturing process apparently also uses the spectacular sounding 'laser stitching': I don't know exactly what that involves, but the stitching looks neat and tight. It also has that 'shininess' I remember from the Black Eagle Predator. 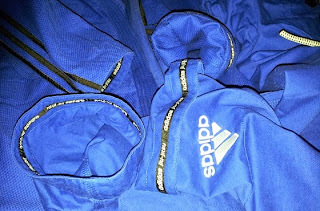 The inner jacket has a rashguard type lining around the yoke of the shoulders, printed all over with 'ADIDAS jiu jitsu' and a little lightning bolt symbol. The large satin bag in which the gi arrives has the same pattern, along with massive drawstrings. There is tape inside the sleeve and trouser cuffs, as well as the bottom of the jacket (thankfully on the inside: I'm not a fan of having that on the outside). That again is printed with 'adidas jiu jitsu' along its expanse, though just normal text this time, white on black. For the trousers, adidas have gone with 280 gsm and what must be the sturdiest drawstring I've seen to date. 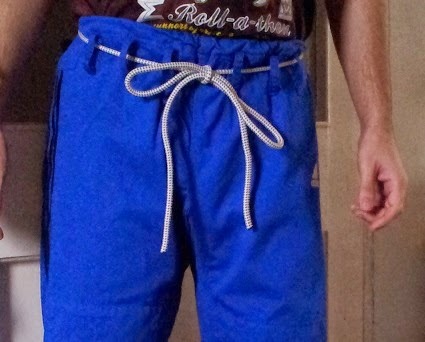 As seems to always be the case with bungee cord type drawstrings, it dangles down to my knees when I put the trousers on. That excessive length is irksome. Even when tied, it doesn't feel properly secured because the ends stick out so much, ready to be tweaked and undo the knot. I sense this may be a personal hang-up though, because other reviewers rarely mention it. Also, it should be a simple matter to cut the ends and singe them to my preferred length. Or indeed just replace the drawstring. There are six belt loops to hold it in place. The gusset lacks those additional triangles of fabric that some of my other gi trousers include (like the Tatami Nova), but there are various other gi trousers that don't have them either (e.g., the Flow Hemp). There is extra fabric inside for the knees, extending to my upper shin. That means it is just long enough to stay in place when I sit on my heels, so that should be sufficient for most A1 wearers (unless you have unusually long upper legs). Numerous examples of adidas branding feature on both the jacket and trousers. 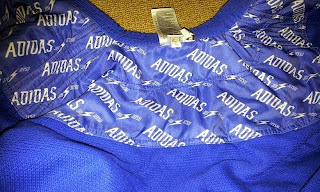 The triangular version of the adidas logo is on the bottom of the collar as well as the shoulder, small and understated. That's also on the upper right leg, along with a beefier version on the back of the lower left leg. 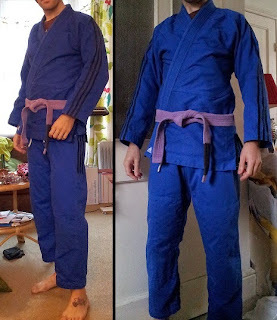 The most distinctive branding on the Contest gi is the three stripes, running down the full length of both sleeves and half way down the trousers. I much prefer that to 'adidas' in huge letters, as would be typical of some other gis. However, the stripes on the sleeve have the disadvantage that if you are in the habit of wiping off sweat with your arm, you're liable to scratch yourself (though personally I use a towel, so it doesn't affect me). There is a sticker on the satin bag proudly proclaiming that the adidas Contest is pre-shrunk. I have been testing it for a month, washing at both 30 and 40 degrees celsius, air drying when possible but also leaving it on radiators. There has been some shrinkage, but not much. Having started with a wingspan of 151cm, that's down to 148cm, while the shoulder to hem length has stayed steady at 78cm. The trousers began at 95cm long, dropping slightly to 92cm. For my body type (5'7 and around 66kg) and preferences, that's a decent fit. Washing also solved an irritation (literally) that I initially had with the gi. There were some abrasive threads inside the jacket by the chest. I will often wear gis straight from the packet without washing (probably bad idea, given that I'm told there are lots of chemicals involved in the manufacturing process). Pre-wash, those threads inside the jacket rubbed my skin raw by the chest, but I haven't noticed that problem since the first few times I wore it. If the Contest gi is out of your price range at £100 (available here in the UK, or in the US here for $178: if you're quick, the 40% off Black Friday sale is still on until 12am tomorrow, EST), then there is also an intriguing entry level gi, at a price competitive with my go-to beginner gi, the Tatami Nova. For £55, Adidas 'Response' gi is squarely targeted at the same market as the Nova. What is especially interesting about the adidas Response is that it's a 265gsm all-ripstop gi, which also comes in kids sizes (for about £20 less: that's the price you'll see when you first look at that page). I would therefore be curious to compare the adidas Response to other budget gis I own, like the Tatami Nova, Black Eagle Basico and Fenom Lotus.